The sap’s a-running from the maples as Spring beckons to us from less than a week away. That means maple syrup from this year’s run will soon be flooding the shelves. What better way to celebrate it than with a maple touched dessert. So how does one acquire a maple flavoured treat? You probably get off the coach, put on your coat and head out the door to—most likely—the grocery store. What do you see when you get there? Overly sugary, overly processed shades of what baked goods should be. Donuts? More like round cakes with a hole. Cookies? 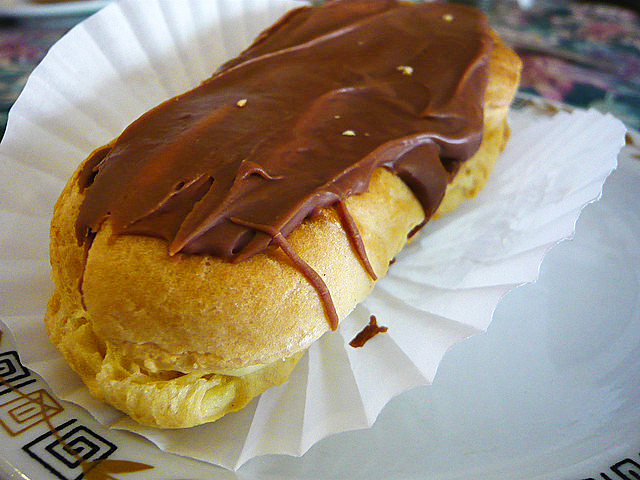 Nothing like you remember your mother making... Éclairs? Forget it. cream and dusted with confectioner's sugar. They’re enough to make your teeth rattle with their sweetness. None of the bakery items you get at the chain groceries give you much more than a nasty sugar rush. They certainly don’t assuage a craving for what you thought you wanted. Why not make the real thing at home? Donuts, I have to admit, are a bit of work. (I have a yeast, braided donut recipe I’ll post another time that is so good it will make you cry.) And there is the bit about all the hot oil on the stove that gives me the willies. A cake from scratch is pretty easy. 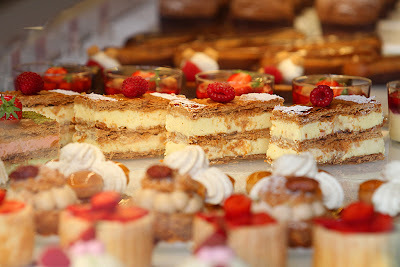 And believe it or not, so are éclairs. Actually, they’re easier than a cake. And this post will prove my point. I need to point out a major difference between cooking and baking. In cooking you have latitude to alter at will and make recipes your own. A little more of this, a little less of that. Baking, conversely, is a series of chemical interactions that must be followed. You disregard directions at your peril. Home chefs usually fall into two categories. One is intimidated by cooking because it’s so open ended; the other is afraid of baking because it’s so exacting. If you like exact directions, then baking is for you. Éclairs are made from three recipes: an easy “choux” pastry (cream puffs are made from it); a pastry cream filling; and a chocolate glaze. It seems like a lot of work but all three actually come together very quickly. Try these recipes to see what a real éclair tastes like. I’ve added the maple syrup as a seasonal touch. The recipes also give non-maple alternatives. Remove pan from heat and make a well in the centre of the mixture. 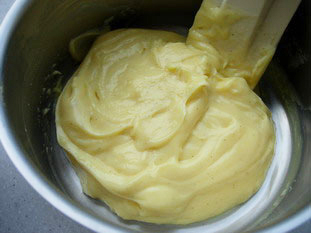 Break one egg into the centre of the well and beat thoroughly until blended. Continue with the remaining 3 eggs, beating them in one by one until combined and smooth. Spoon mixture into a piping bag and then squeeze into logs, about 3" (7-8 cm) long and 1/2" (1.25 cm) high onto parchment (or silicone baking mat) lined baking sheet. Space the logs about 2" apart to allow for spreading. Dip a pastry brush into the beaten egg and flatten any tips left from piping the logs. Bake for about 20 mins until they have risen and are golden. Remove from oven and pierce the side of each puff with a sharp knife to let the steam out. This helps them not collapse. Put the trays back into the turned off oven, leave the door ajar and allow to cool down slowly for 10-15 minutes. Remove from the pan and place on a rack. Whisk together the flour, sugar, salt, butter and eggs in a heavy saucepan. Slowly add in the milk, whisking to ensure no lumps form. Place over medium heat and bring to a boil. Care must be taken not to let the mixture “catch” on the bottom of the pan. If so, it will scorch and impart a burnt flavour. Stirring constantly, allow to cook for a few minutes until thickened. Remove from the heat and stir in the vanilla. Whisk occasionally as it cools. If you prefer a lighter filling, mix in some whipped cream after the pastry cream has cooled completely. 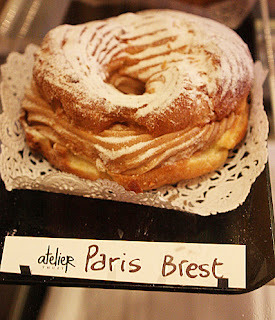 With this recipe you'll have enough leftover for something else, so why not try a Paris Brest? Traditional: 1/2 teaspoon vanilla extract, or 1/2 tsp Grand Marnier, dark rum, coffee liqueur, etc. Place a bowl over simmering water on the stove. Add all ingredients except for the flavouring. Stir until smooth. Remove from the heat and stir in your chosen flavouring. Paint with a pastry brush or drizzle the chocolate on top of the éclairs.